Murals do more than just paint a wall, they stimulate activity and improve the Downtown economy. In Hollywood, Fla., artist manager Jill Weisberg curates contemporary outdoor murals at select locations in Downtown Hollywood that illuminate the area. 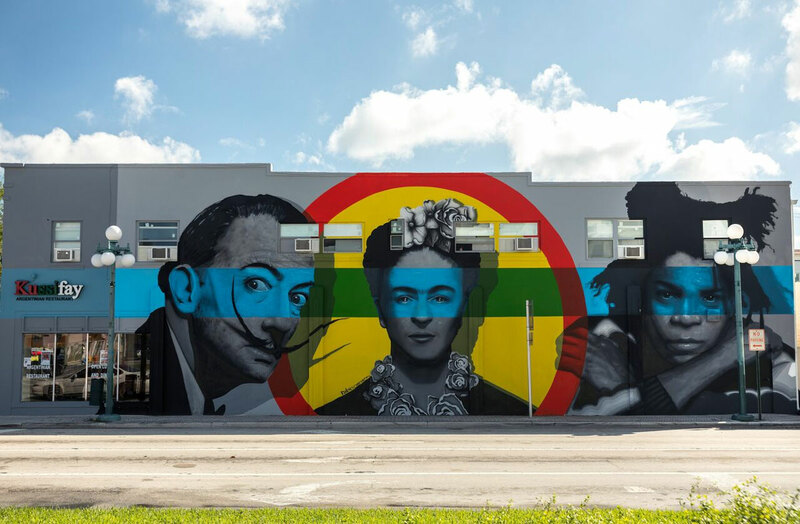 The historic little town of Hollywood has gotten a vibrant new look the last few years, as the Downtown Hollywood Mural Project, launched in August of 2012, has become the largest walkable mural project in Broward County, rivaling Miami’s Wynwood for high profile, renowned local, national and international artists. Artist manager Jill Weisberg curates contemporary outdoor murals at select locations in Downtown Hollywood that illuminate the area. Murals do more than just paint a wall, they stimulate activity and improve the Downtown economy. Local business benefit by having more traffic and people that live or work in the community benefit by having compelling works of art that are constantly visible. Weisberg gives monthly tours that add to the information and appreciation of the murals. Jill’s knowledge of art –she has a Masters degree – gives her an edge on the big picture. Weisberg has shown her fine art across the United States and is an accomplished graphic designer, art director and curator. Her fine art practice consists of thought- provoking 2-dimensional work and murals with a feminist edge. A background both in design and fine art has influenced her to create work that uses both parts of her experience in those fields. Working in Miami around some big names in the art world led to them being selected by Weisberg for Hollywood murals. Kenny Scharf, Logan Hicks and the London Police all have murals around the world and in Hollywood. Getting Scharf, who creates wildly colorful cartoony characters and was one of the original street artists from the downtown NYC scene in the 1980s along with Keith Haring and Basquiat, was actually quite easy. The newest mural is town is along 20th Avenue below Harrison Street by Key Detail, a Belarusian artist who works with painting, drawing and illustrations. He studied Architecture in Minsk, Belarus and currently lives and works in New York City. Growing up in Minsk, Key Detail has been active on the street art scene since 2000s, and works towards developing his unique style and his skills on the streets. His art is a balanced concentration of emotional reflections on reality transformed by the prism of surreal interpretation. His flamingo mural is both abstract and narrative as a hot pink parade of bird heads angles their way down the length of the mural and the whole of the block. It could have been kitsch but is instead a beautifully executed design that zeroes in on the eyes and colors and darting movements of the colorful flock. Driving into the downtown area on Hollywood Blvd another new painting splashes across 21st Avenue. The huge recognizable faces of Salvador Dali, Frida Khalo and Basquiat proclaim their surreal premiere status in the art world. 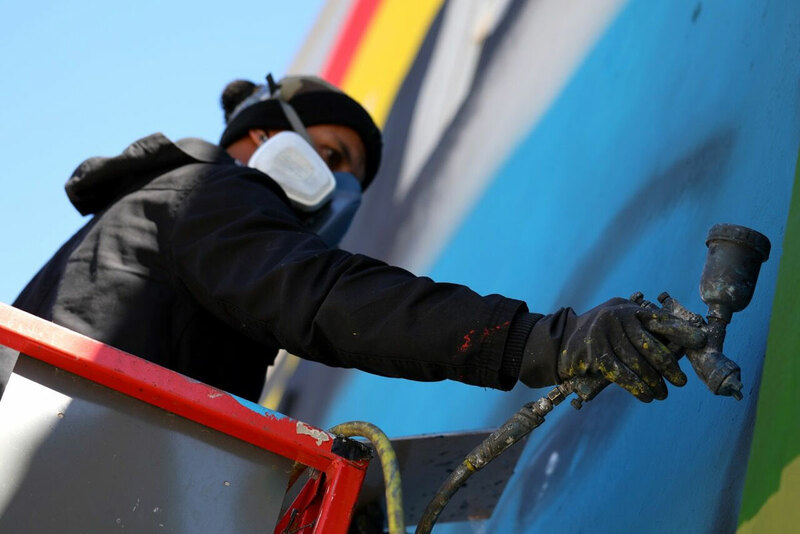 The mural is by Brazilian Fabio Onrack, a fine art painter and muralist with a passion for transforming urban spaces. Since completing his MFA in Visual Arts and Painting from the University of São Paulo, he has collaborated extensively with the Department of Education in Brazil, completing large-scale murals in over 40 schools throughout São Paulo. Fabio’s work combines photorealistic portraiture with 3-dimensional effects and colorful geometric shapes. His introduction to painting came through a near death experience in his early teens, and has given his work a subtle undertone of gratitude, peace and unity. Hollywood has also grown to love the enormous sunset mural on the side of a parking lot by Miami natives Monica and Tasha Lopez De Victoria, better known as the TM Sisters. Their work spans from mixed media collage to site-specific interactive video performance and everything in between — installations, fashion, social experiments, events and performances. Their work is immersive and colorful and influenced by South Florida’s landscape — cultural presence, energy, weather and its colors. The largest DHMP mural to date, the sisters painted the multi-story impressionistic mural of a sunset on the Radius parking garage. The mural can be seen throughout Downtown peeking through the buildings. For information on tours and the murals see DowntownHollywoodMuralProject.org.